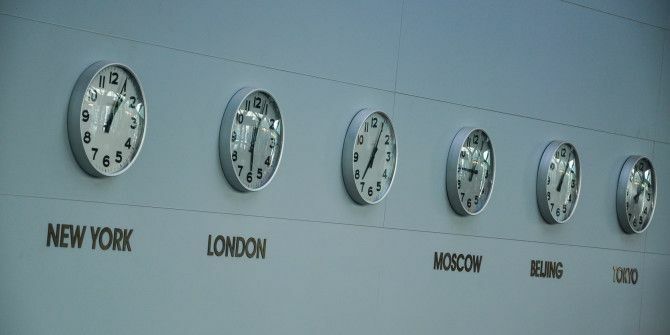 Time zones matter more than ever in our interconnected world. Since business calls, video conferences, and other meetings can involve team members around the globe, it’s important to be mindful of where others are so you aren’t asking them to meet at 3 AM! You can use Web tools to visualize time zones 10 Ways to Visualize Time Zones Around the World & Be on Time 10 Ways to Visualize Time Zones Around the World & Be on Time Read More , but if you’d rather have specific zones at your fingertips, you can add up to two more clocks in Windows 10 (this also works in 7 and 8/8.1). Start by opening the Start Menu and typing Date and Time. Once you get the dialogue, switch to the Additional Clocks tab. Above one or both entries, check the Show this clock box to enable an additional time zone. Choose the time zone you wish from the list, give it a friendly name, and click OK.
Now when you mouse over the date and time display on the right side of your taskbar, or click this information, you’ll see the clock for the extra time zones you just added in addition to your own info. Even if you’re not in a business that requires juggling time zones, you can still take advantage of this feature to keep track of what time it is for out-of-area relatives, or just add UTC so you have a centralized unit of time to refer to if needed — this could save you from having to use an email time conversion tool How to Email Smarter With Buit-In Time Zone Converters How to Email Smarter With Buit-In Time Zone Converters Read More . How do you make use of additional time zones? Share anything you have to offer with us on this topic in the comments! Explore more about: Time Management, Windows Tricks.